Hi Friends. Welcome to the blog of the Pine Gap trial, held in Alice Springs. 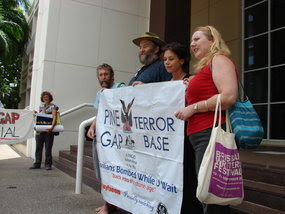 For a background of the case and our group, and other stories please see www.pinegap6.org. At the bottom of the page is a photo of the four accused (from left) Jim Dowling; Donna Mulhearn; Bryan Law and Adele Goldie arriving at court on the first day of the trial, Tuesday 29th of June 2007. THE PINE GAP 4 HAVE WON THEIR APPEAL! Today Bryan, Jim, Adele and Donna were acquitted of their convictions under the Defence (Special Undertakings) Act 1952. It was a unanimous decision by the full bench of the Northern Territory Court of Criminal Appeal. The three judges agreed with our submission that there was a miscarriage of justice at last year's trial because we were not able to bring evidence before the jury about the function of Pine Gap. There were other grounds to the appeal, of a more technical nature. The judges will publish the detailed reasons for their decision in coming weeks. The Prosecution quickly sought a re-trial, but was quickly rebutted. "What would be achieved for these individuals or the community if there is a re-trial?" asked Justice Riley rather sternly. The judges unanimously ruled there would be no re-trial. The fact that we had already served prison time was a significant factor in their decision to refuse a re-trial. We are all very glad we did this as now our slate is clean regarding the other charge of 'damage', under the crimes act. So now it's all over! This 'David vs Goliath' outcome is a result of the excellent work of our legal team: Ron Merkel QC, Rowena Orr and Russell Goldflam. Their commitment, persistance and brilliance was amazing. They should be heartily congratulated. (I hope to have a way for you all to do that soon). The result now raises significant questions for the Government about the use of the Defence (Special Undertakings) Act 1952. It was the first, and mostly likely last time it will be used in this context. It is a victory for fairness and common sense, and a slap in the face for Prosecutor's who seek to use draconian legislation to respond to pacifists partaking in non-violent civil disobedience with an extreme witchunt. Congratulations to our Pine Gap colleagues Jessica Morrison and Sean O'Reilly and thanks to everyone involved in our journey since December 2005. It's been an amazing experience for all of us! Put Pine Gap on trial! Photo Courtesy of ABC Online - their story below. The Territory's Court of Criminal Appeal has quashed the convictions of four protesters who broke into the Pine Gap defence facility three years ago. Last year, Bryan Law, Adele Goldie, Jim Dowling and Donna Mulhearn were found guilty of breaking into the spy base using wire cutters in the Northern Territory Supreme Court in Alice Springs. They were the first people to be charged under the Defence Special Undertakings Act of 1952. The foursome were fined a total of $3,000. They appealed against their convictions, and today the Territory's full Court of Criminal Appeal found in their favour. It's now off to the Director of Public Prosecutions to decide whether to pursue a retrial or drop the matter. Minor convictions for trespass and criminal damage will still stand. Bryan was released from prison this morning, as expected. When we arrived at court we found him in good spirits enjoying a hot cappucino and toasted sandwich in the cafe. After 10 days of prison food, he was thrilled! He was in good form and very much looking forward to watching the appeal with us in the public gallery. Ron Merkel QC, continued his submission on our behalf. He was as eloquent, persistent and convincing as ever. Late morning there was an unexpected turn of events: The three appeal judges began to consider Jim’s position as the last defendent left in custody. They clearly wanted him granted bail and released but were unsure of their power to do it immediately. During the lunch break they investigated the matter. We were pleasantly surprised at their determination to see him freed as soon as possible. After the lunch break he was granted bail and able to walk free from the dock to the public gallery and later out the door with us! Jim was not due for release until Monday. Hooray for that unexpected blessing! The prosecution then rose to begin its argument against our appeal, which they will conclude in the morning. We were all very pleased with the events of the day, especially the way Ron was able to advance his arguments to support the quashing of our convictions. We head into the final day tomorrow…. In a surprising turn of events Jim Dowling of the Pine Gap Four was unexpectedly released from prison today in the Darwin Court of Appeal. Mr Dowling, who was due to remain incarcerated until Monday 25 Feb, was released on bail pending outcome of the appeal. He was delighted to join friends and supporters in the court gallery at 3.15pm. Mr Bryan Law was also released this morning after serving his sentence of ten days in lieu of fine payment. Meanwhile Mr Ron Merkel QC advanced strong arguments to quash the June 2007 convictions of the Pine Gap Four under the Defence (Special Undertakings) Act of 1952. Mr Merkel argued against a retrial saying it would be out of the question due to the costs already borne by the Australian public, the court system and the Pine Gap Four personally and financially. "Enough is enough", he said. Mr Paul Usher for the DPP began his case but told Justices Martin, Angel and Riley that he was also awaiting further instruction from Director of the Commonwealth DPP, Mr Chris Craigie SC, who was unable to be reached this afternoon. The appeal continues at 10am tomorrow (Friday 22 Feb). The appeals of the Pine Gap Four began today with Mr Ron Merkel QC successfully applying to exclude the Commonwealth legal team on the grounds that the Commonwealth and Crown's interests in this case "are identical" and that Commonwealth intervention in the matter was an unnecessary intrusion. Five of the seven DPP lawyers were then excused from the courtroom. The remainder of the day was taken up with lively - though intricate - judicial discussion of the extraordinary use of the Defence (Special Undertakings) Act 1952, led by Mr Merkel. The trial continues today (Thurs 21 Feb) with the appeal against the June 2007 conviction. It is expected the DPP's appeal against the leniency of sentencing will be heard either this afternoon or Friday morning. The mood of the Pine Gap Four (Donna Mulhearn, Bryan Law, Jim Dowling and Adele Goldie) is positive. Mr Law will be released from prison this morning, and Jim Dowling will remain in jail until Monday 25 Feb.
After day one of the Pine Gap 4 appeal in the Northern Territory Court of Appeal in Darwin, I'll repeat what I've been quietly declaring all day: "I think we're winning…"
After saying that, I'm mindful of the fact that our legal team is still presenting its case and the Prosecution hasn't had a chance to speak yet, but that's a minor detail! But realistically, by lunchtime tomorrow I might have a totally different opinion. I have to confess I was never really expecting to have our convictions overturned at this appeal, but when I admitted such to our very own QC, Ron Merkel, this morning, his response was "why not? The objective is to win!" He then put me and my doubt to shame by proceeding to present five hours of dazzling legal argument, whilst barely taking a breath! We won the first legal argument: an application by the Commonwealth and its agencies (ie Dept of Defence, Federal Police, ASIO etc) to be party to the appeal and have its lawyers at the table. Ron argued that any third party intervention would be "meddling" in a dispute between the crown and the accused. "It's an important matter of principle. The rules of intervention are quite clear," he told the court. After one hour of debate the panel of three judges returned a ruling against the Commonwealth intervention. Round One to Ron Merkel. The band of Commonwealth lawyers (5) packed up their bags and retreated. It was a good omen. Then the real action of the appeal began: Ron began to lay out his arguments of the appeal which are quite technical and complex. They relate to definitions used in the Defence Special Undertakings Act 1952 (under which we are charged) about what is a "prohibited area", and matters of procedural unfairness at the trial. He reminded the judges that protestors at Pine Gap would normally be charged with trespass and dealt with in the Magistrates Court, and of the significance that no one had ever been charged under the 1952 DSU legislation. “The issues the act raises at the time of the offence in 2005 are not the issues parliament had in mind back in 1952,” he said. “Pine Gap was not in the contemplation of Parliament in 1952. “The legislation has extraordinary power to make any area a prohibited area and trespassers punished with seven years in jail. I will spare further details of the next five hours of legal argument, the judges asked many technical questions and everyone did their best to follow. But Ron’s conclusion was clear: because of the errors made by the original judge our conviction should be quashed and no new trial ordered. We had good local support at a vigil outside the courthouse before the appeal began and in the courtroom. Also an excellent report on ABC TV tonight. Ron did not finish presenting his arguments today, he continues at 10am tomorrow. Here's Donna's thoughts about her impending arrest written last night..
My friends groaned with concern when they heard I would spend a few days in prison. "Be careful," they advised with big eyes and a solemn tone, "you remember what happened on Prisoner." Thankfully I never watched Prisner - that 1980s prison drama set in Cell Block C or D of some women's prison somewhere. But I do recall there were some big, butch, angry prison officers, and less than charming inmates whose tense interactions kept the attention of Australian viewers for many years. So with a mind free from the unpleasant images my friends have of Cell Block C, I am going into this experience naively optimistic. That's not to say it won't be damn hard. But not every experience that is hard is bad. I'm in Darwin now (Wed). They took Bryan into custody on Tuesday so that's why I'm trying to get my thoughts together now - notes to people, instructions, what did I forget to do. Just about everyone I have spoken to in the last month has asked me: How do you feel about going to prison? I will be relieved when the strip search is over. I am not as worried about what prison officers might say to me, as what I might say to them. You may have noticed I'm one who tends to speak my mind, whether invited to or not. If I think there is a situation that is de-humanising, I will most likely challenge it, in a friendly but firm manner. I have been encouraged to do this by experienced people, but don't worry; I will play it by ear! I will not be allowed to bring in anything. My clothes and possessions will be taken and I will be issued with a pair of shorts and a t-shirt, the colour of which will indicate which security risk I am: low, moderate or maximum. I am curious about which colour I will get, I am also curious about how the other prisoners will cope with the sight of my legs considering I have not worn a pair of shorts for 15 years! I am disappointed I will not be able to watch the historic Government apology to the stolen generations on Wednesday, but what an interesting place to be - a prison in the Northern Territory where 85% of the prison population are indigenous. I will be curious about their opinion. Will they give me a toothbrush? Will I share a cell with Adele, or someone else, or be on my own? Will I have any privacy at all? What will the other prisoners be like? If I joke with the prison officers will it be well received, or frowned upon? Can I have a cup of tea when I want to? Will I get any sleep with the noises and lights? Will I hate it and try to organise a break-out? Will I wish I had watched Prisoner as a child so I least I was more prepared? I was not prepared to contribute financially to the Government's coffers by paying my fine, but in the tradition of civil disobedience I am prepared to take responsibility for my actions and accept the penalty of prison time in lieu of the fines. It will be the next stage of a journey that started a long time ago. It is a journey that has a lot of meaning and purpose, and that's what I will draw on when I get frustrated. I am treating the next five days as a kind of spiritual retreat. I have made a schedule of activities in my head that includes meditation, tai chi, exercise, gospel reading and journal writing. I have connected with prison chaplains, and they will bring me books and company. I have requested to receive communion. In the season of lent, a time of deeper spiritual discipline, what better place could I be? The desert of Cell Block C.
I am told we will be locked in our cells from 3.30pm until 8pm the next morning - sounds like a boring stretch but I am a contemplative - solitude and quietness is food for my soul. I am wary, I am curious, I feel strong and I feel alive. Speaking the truth to power, despite the consequences, is always liberating. PS: I hope to get some messages out via the prison chaplains, if not, you might hear from me again on Monday. PPS: "Here I stand. I cannot do otherwise. So help me God." Martin Luther. Hi friends, the Four are in custody now serving short sentences (5 days-2 weeks) for non-payment of their fines.. below is the press release sent out earlier today. Three Christian pacifists were taken into custody this morning (Wed 13 Feb) as they prepared for a planned 2pm vigil at the Supreme Court steps in Darwin. A fourth member of the group (Bryan Law) was arrested yesterday afternoon. The Pine Gap Four, convicted last year under the untested Defence (Special Undertakings) Act of 1952, will next week contest the DPP's appeal against the leniency of their sentences in the Darwin Supreme Court. Bryan Law of Cairns, Jim Dowling and Adele Goldie of Brisbane and Donna Mulhearn of Sydney will serve short jail terms (5 days – 2 weeks) as a consequence of their decision not to pay the fines imposed by Justice Sally Thomas in June 2007. "The Federal Government,' said Ms Mulhearn, "is involved in funding wars around the world and involved in various wars and so we made a decision that we would be very happy to take responsibility for our actions but we're not willing to contribute financially. But we will serve our prison time in lieu of that." On January 4, 2008 Richard Ackland published an article in the SMH discussing "an impressive list of civil liberties violations in our relaxed and comfortable land", listing the Pine Gap Trial as one of the "fresh outcrop of abrasions to our rights". 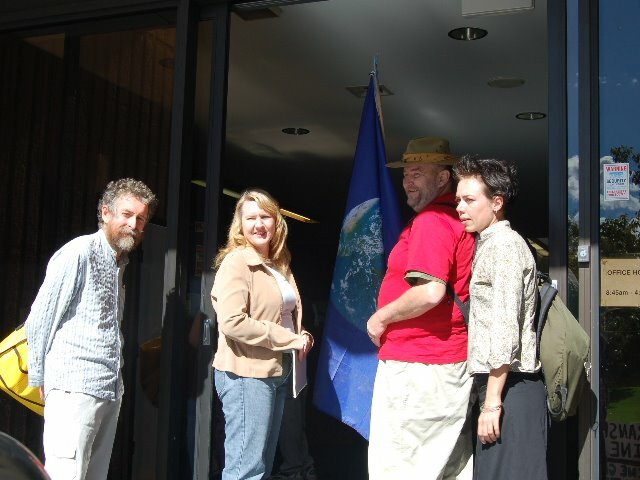 The 'Pine Gap Four' entered the prohibited zone of the Pine Gap Joint Defence Facility on December 9th 2005 to conduct a Citizen's Inspection, with the intention of highlighting the base's - and Australia's - role in the Iraq war. Previous incursions into the base resulted in charges of trespass, but then-Attorney-General Philip Ruddock created legal history by directing the DPP to charge the Four under the 1952 Act, carrying a sentence of up to seven years imprisonment. Barrister advising the Four, Rowena Orr, said "The Defence (Special Undertakings) Act limits the fundamental right of freedom of movement of citizens." Prosecuting Counsel Mr Hilton Dembo claimed the group's deliberately non-violent and transparent actions "struck at the heart of the national security and national interest". Justice Thomas noted that Pine Gap has a significant history of protest and trespass. "It's a big step up to talk about a jail sentence," she said during the 2007 trial, "a prison sentence is one of last resort." The group were found guilty and sentenced with minor fines on June 15 2007. Several months later the DPP decided to appeal the sentences (see below)* saying Justice Thomas failed to have regard to the maximum penalties and that the imposition of fines was "manifestly inadequate". "What this journey so far tells me" said Mr Bryan Law "is that the Commonwealth (in this case ASIO, the AFP, the DPP, and the DoD) is seeking to increase the criminal punishment for civil disobedience in what can only be an effort to curb political dissent." Ms Mulhearn and Ms Goldie have also lodged appeals against the group's convictions. "This is based," said Ms Mulhearn "on various points of law relating to the use of the Defence (Special Undertakings) Act and other matters that did not allow us to have a fair trial. "I don't believe I committed a crime. What I did was an attempt to transform a military base into something open and honest. I've witnessed first hand the activities of Pine Gap and the result of what occurs there. I've seen women and children's bodies ripped to pieces and maimed. "We felt we had a moral obligation. As human beings we have a responsibility that rises above technical law." Mr Law agreed: "What's moral is not always legal, and what is immoral is not always illegal. If there is a minor law that has to be broken in the pursuit of moral faith then I will break it." The Pine Gap Four follow the non-violence philosophies espoused by Jesus, Gandhi, Martin Luther King and Dorothy Day. The appeal starts on Wednesday 20 February. The appellant appeals against the sentences imposed by the Supreme Court of the Northern territory of Australia at Alice Springs on 15 June 2007 on charges of damaging Commonwealth property, contrary to section 29 Crimes Act 1914 (Cth), entering a prohibited area, contrary to section 9(1) Defence (Special Undertakings) Act 1952 (Cth) and use a camera in a prohibited area, contrary to section 17(1) Defence (Special Undertakings) Act 1952 (Cth). Having regard to the objective facts and circumstances, the imposition of fines by the Learned Trial Judge was manifestly inadequate. Tues 19 Feb 6.30pm – Public meeting, Groove Cafe, Pavonia Place, Nightcliff. Wed 20 Feb – Appeal begins Darwin Supreme Court. INTERVIEWS with defendants available – photographs also available, including portraits & action pics.